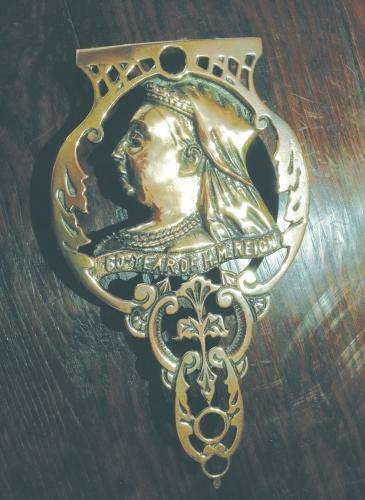 Original Victorian cast brass pot/iron stand, with a pierced design of the head of Queen Victoria, surrounded by acanthus leaves and other shapes and above "60th Year of H.M.Reign". This was issued to commemorate Queen Victoria's Diamond Jubilee in 1897. The reverse is impressed "Regd", has two plain legs and two other supports. This also appears to have had the fittings for grate mounting as an option. All is complete and in good order. 8.75" x 5" x 1".